What type of hedges should you plant? So you find yourself doing research about what types of plants to purchase for a hedge? To begin, what type of hedge will this be? A privacy hedge or a decorative hedge? Some plants are better suited for a privacy hedge since they tend to have full foliage. Some will have thorns to deter wall hoppers. Others will have a mounding or round shape while others are taller and columnar. Flowering plants are great for decorative hedges. Or try layering different size plants; a decorative hedge in the front while the privacy hedge stands tall in the back. Second, what is your budget? Most people will have some kind of budget in mind for the project. If you have 150 linear feet to cover as opposed to 20 linear feet then maybe you chose a less expensive plant. Or if you have your heart set on a particular plant then what the heck, go all out, splurge a little. Third, where are the plants going to be located? A small yard or a large yard? A pathway? This is another important question, because there is nothing worse than spending time and money on a project for it only to be a disaster. No one wants a plant that is advertised to “grow only 15-20 ft high max” but then come to find out that it took over your yard and is now 45 ft high. And last, what type of maintenance are you willing to do? None? Once a month trimming? Now this one is a big deal, probably more important than the budget question. Because if you decide on an fast growing plant that tends to grow up to 35 ft naturally but you only want to keep it trimmed at 10 ft once a every 6 weeks, well it could become a problem for you and/or your neighbors if you wanted ‘low maintenance’. The overall idea is to pick the right plant for the right place. A good rule of thumb is to “go native” as much as you can. Stay away from invasive and exotic’s that reap havoc to your native ecosystem. Here are some plants that I find are great for hedges, pro’s and con’s, as well as an FYI list of invasive’s. The beautiful bougainvillea has a more unusual growing habit than most plants. It can grow as a vine or it can be cut back to a more compact form. As most of you know, the bougainvillea has thorns along it’s branches which makes a great briar patch. Someone will think twice about climbing over your wall. Though this vigorous grower needs alot of maintenance to keep this plant in check because it will grow wild. Loves full sun, heat and can handle dry conditions. Good for low, medium and trellised high wall hedges. Variety of prices from affordable to expensive depending on the type of hybrid. I haven’t used the orange plume flower for a hedge before but I think it could work really well. It is a prolific grower and can spread over a large area pretty quickly. It gets about 7-8 ft high and does well in all kinds of conditions; full sun, part sun, no water, lots of water. The oriole’s and hummingbirds love the gorgeous pom-pom flowers. The natural growth habit of the plant isn’t super easy to trim but it gets much thicker by growing new shoots from the cut areas. The orange plume flower is becoming more popular but the pricing can still be a bit on the high side. The podocarpus is an absolutely gorgeous dark green plant with needle like leaves will give you lots of privacy. Very easy to maintain though a slow grower and pricey. 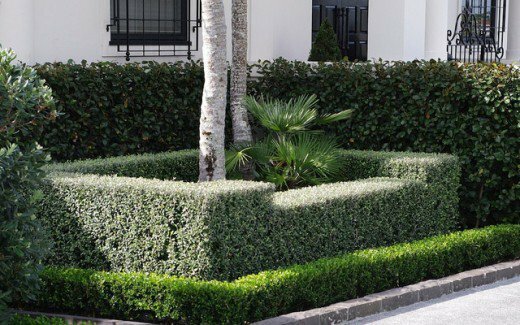 Podocarpus are typically used as a formal hedge since they create a sharp edge when trimmed due to the small leaves. Grows in full sun and are very hardy. Can be a low, medium or high hedge. Green island ficus is found just about everywhere in residential and commercial landscapes. It is a great low maintenance plant that withstands just about all South Florida weather’s & abuse. Easy low maintenance which can be trimmed for a formal look or let it’s natural beauty shine. It can be on the slow side of growing but spreads out nicely. Grows to about 5 ft high max, so can be a low or medium hedge. Very affordable. also known as a pitch apple is drought tolerant & salt tolerant, and are becoming more popular as a hedge. It branches low and has large, thick leathery leaves, which work well as a privacy screen. It can be trimmed to stay within 5 or 6ft. It prefers full sun, or partial shade and requires good drainage. Scratch your initials on a leaf and it will stay forever! « Now! Is the best time to fertilize.